Daegu Fatima Hospital has a new C.E.O., Sr. Anita Park. She was appointed by Mother Prioress Lumen Choi to take over the position of Sr. Jean Marie Chang, who served the Hospital for the past 6 years. Sr. Anita Park will be the 8th C.E.O. The transition ceremony took place at Link Hall on Friday evening, August 29th. 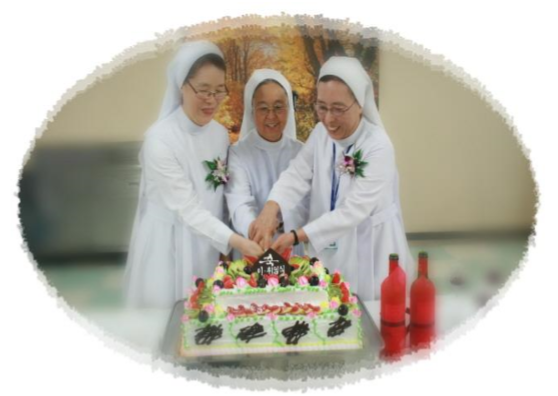 On behalf of the entire Daegu Priory House community, Mother Lumen Choi expressed great gratitude to the former Sister who struggled and worked tremendously in developing a high-quality Hospital, and asked Sr. Anita Park to keep the ministry of healing ever anew as the new leadership. In her remarks, Sr. Anita Park unveiled plans to intensify the healthcare of patients with a strong hospice system design and an advanced treatment process, with a new vision focusing on patient service.